Cineworld - The Chip's Challenge Wiki - The Chip's Challenge Database that anyone can edit! 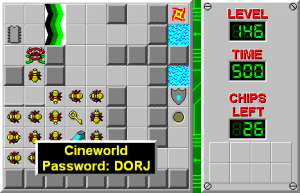 Cineworld is the 146th level in Chip's Challenge Level Pack 1 created by Tom Patten. It is one of the Secret levels in CCLP1. To start, head northeast to the area with two trapped fireballs and press the brown button. This will release a glider which will hold open the trap blocking the northeast portion of the level. Head north through the trap next to a trapped teeth and find suction boots in one of the toggle wall rooms. Leave the north area through the trap you entered from and locate a green button in the southwest portion of the level. Return to the toggle wall rooms in the northeast area to obtain the red key. You will still not have access to all the chips in this area. With the red key in hand, head toward the middle of the level and open the red door. Lure the teeth out of the room onto the green button surrounded by force floors. This will cause the teeth to repeatedly press the green button, allowing you to pick up the remaining chips in the northeast. The room in the northeast corner has a brown button which should be held down with a block. This unlocks access to the northwest portion of the level. 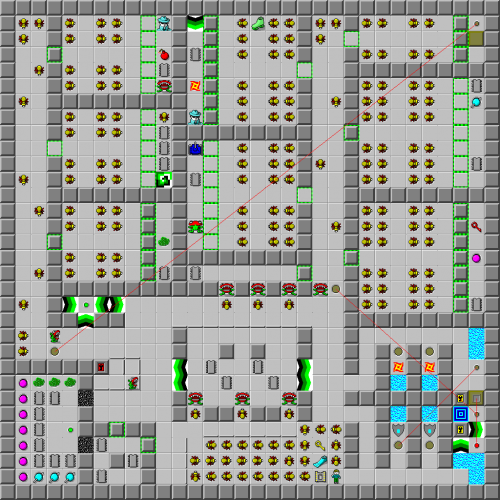 Collect the chips in the northwest corner of the level along with the chips bound by force floors to the south. Finally, head back to the beginning of the level, enter the socket and collect the flippers and yellow key. You can then proceed to the exit to the east. This page was last edited on 26 February 2019, at 04:23.